Penn's Cave and Wildlife Park is located about 15 minutes outside of State College in Pennsylvania in a beautiful little town called Centre Hall. We traveled up to Centre Hall from Harrisburg during the peak of the Fall Foliage season, so our drive up to northern Pennsylvania was beautiful. 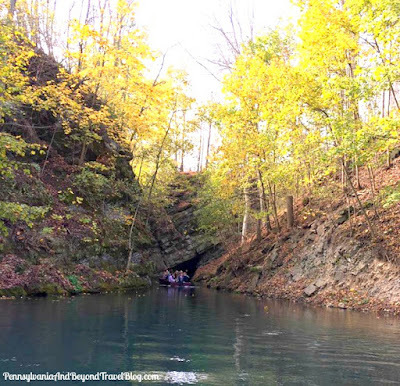 The cave is America's only all water cavern, so the only way that you can tour the cave/cavern is via a guided tour on a motor boat. Each of the guides are well experienced and knowledgeable about the cave formation, it's past inhabitants and the history surrounding it. Centuries ago, the Seneca Indians discovered this natural landmark in the Valley of Karoondinha (Penn's Valley). The cavern was opened to the public back in 1885 and has been open ever since. 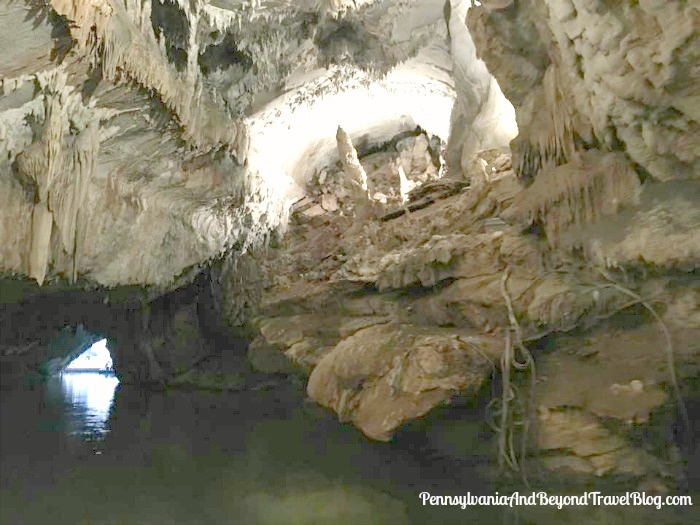 It is the only cavern in Pennsylvania on the National Register of Historic Places. When people think of Native Americans, they think of the Southwest portions of our country. Well, Native Americans inhabited most areas of the United States, including the northeast. The Seneca tribes were in great numbers here in Pennsylvania and New York. When you arrive at the park you'll want to head to the gift shop to pay for your admission. 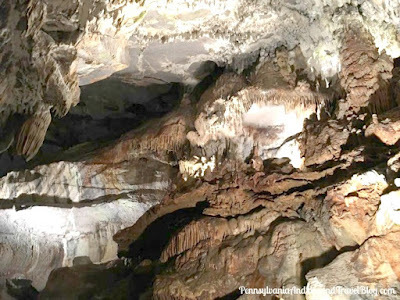 You can purchase a combo ticket which includes your tour of the cave and a tour of the wildlife park or you can just pay your admission fee to just visit the caverns. Parking is free. During their busy season and/or weekends, you may have to wait a bit until the next tour begins. We ONLY had to wait 15 minutes. Once your tour group is ready to begin...you'll have to walk down a steep and lengthy flight of stairs. They are NOT handicap accessible, so if you have mobility issues, this tour is most likely not for you. Our group had 9 adults and 3 children in it, plus our tour guide. You'll want to wear comfortable walking shoes and dress appropriately for current weather conditions. It is very dark in the cave and they do have some fixed lighting and use spotlights to help guide the way. The cavern is a constant 52 degrees year round, so you might want to wear a light jacket or sweater. You can take all of the photographs that you want while on your tour. Some of the famous formations you will see are: The Statue of Liberty, Leaning Tower of Pisa, Nittany Lion and more! Once you go through the cavern you will come out the other end into Lake Nittany which is also part of the experience. As our boat swung around the lake we got to see a few white-tailed deer grazing nearby and some mallard ducks. You enter the cavern again and go through for a second time until you reach the boat dock. The entire cavern tour took us about 40 minutes from start to finish and was really nice! Once off the boat we headed back up the steps and onto the ramp to head to the gift shop and the Cave Cafe where you can purchase some souvenirs or grab a bite to eat. Along the walk you can stop to read about The Legend of Penn's Cave or about the Stone Formations that are there. You can visit Penn's Cave and Wildlife Park website for driving directions, hours of operations and to obtain additional information. 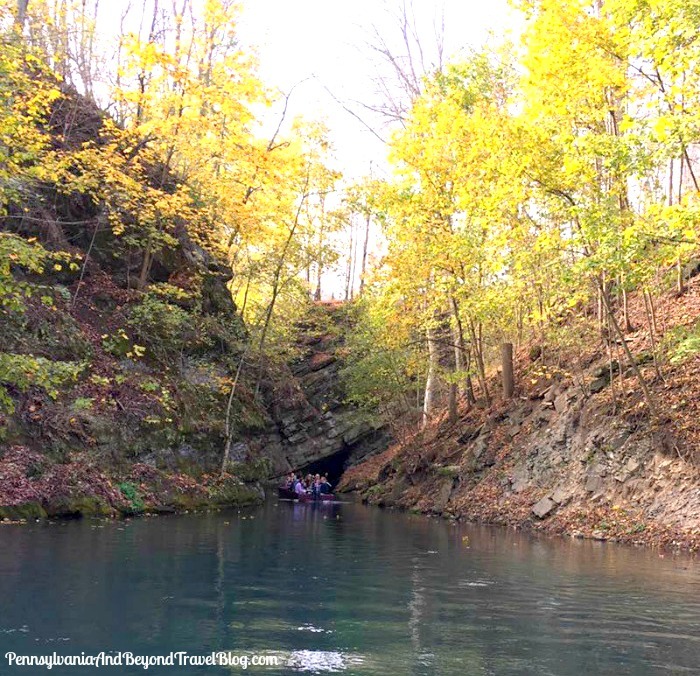 If you want to experience some of the best Fall foliage in the area, we recommend that you plan your visit for the first or second week in October. We highly recommend this family-friendly activity in Centre Hall, Pennsylvania.